The shapes of these tiny ridges and furrows are the best of all data by which a man or woman can be identified. Their great merit consists in the fundamental facts that they are never the same in two individuals, that they remain practically constant in the same person from the cradle to the grave, that they cannot be artificially modified, and that they can easily be classified for handy reference. A new terror has been added to the ways of crime, since every burglar carries a potential conviction at his finger-ends. At the Clerkenwell Sessions last week a man was convicted of housebreaking on no other evidence than that of the fingerprints which he had inadvertently left upon a pane of glass in the window through which he had made his forcible entry. Another of the fraternity who was captured about the same time was wearing a pair of thin kid-gloves by way of precaution against leaving such damnatory marks behind him. This is an eloquent testimony to the wholesome effect which the work of Dr. Francis Galton has had upon the work of criminal investigation. It may seem at first sight that the mere impression of a man's finger-tips affords but a slender basis on which to condemn him to hard labor. But as a matter of fact there can hardly be any more convincing evidence of his guilt or identity. Of all the physical characteristics by which we are guided in distinguishing between human individuals there are none more certain or more invariable than the tiny ridges and furrows which cover the skin of the hands, and which are most conspicuous, because least liable to flexion, on the tips of the fingers and thumbs. The notorious Beck case recently showed us how uncertain and misleading the ordinary methods of Identification may be. Detective-Inspector Collins mentioned at the trial last week that they have photographs at Scotland Yard of two men who are so much alike that the police can only tell the difference between them by their fingerprints. Yet these tiny and almost unnoticeable marks afford an unmistakable method of differentiation. Anthropologists now universally agree with Dr. Galton. who first drew attention to the subject in this country some fifteen years ago, that the shapes of these tiny ridges and furrows are the best of all data by which a man or woman can be identified. Their great merit consists in the fundamental facts that they are never the same in two individuals, that they remain practically constant in the same person from the cradle to the grave, that they cannot be artificially modified, and that they can easily be classified for handy reference. "They form patterns, considerable in size and of a curious variety of shape, whose boundaries can be firmly outlined, which are little worlds in themselves. They have the unique merit of retaining all their peculiarities unchanged through life, and afford in consequence an incomparably surer criterion of identity than any other bodily feature." Excellent though the Bertillon system of body-measurements is, it yields in certainty and simplicity to the fingerprint system, which is now used to supplement or supplant it. A man may change in height and breadth, in complexion and the color of his hair. He may be an adept in facial disguise, like the late Charles Peace. He may even succeed in modifying or obliterating his skin-marks. But he can never alter the tell-tale writing on his finger-tips, which appears again practically unchanged even after the skin has been destroyed by fire or acids. A dead body beaten out of shape by the waves can be identified by the fingerprints; forgery and personation can be detected; even Jezebel, when the dogs had devoured all but the palms of her hands, could have been recognized by them if this system had been known to her people. The peculiar usefulness of the fingerprint method of identification to the police is two-fold. In the first place it affords an unquestioned means of identifying the habitual criminal whose fingerprints have once been impressed on a piece of paper and tiled in the archives of a detective office. At Scotland Yard there is now a well-organized fingerprint department, which already possesses the record of the finger-tips of a hundred thousand persons who have come under the notice of the police. An ingenious but simple method of classification, depending on the establishment of certain fundamental types under which all fingerprints may be placed, makes it possible to consult this great "dictionary of the criminal classes" with ease and rapidity. Thus an arrested person can speedily be traced, if he is an old offender, and fingerprints left by a burglar or other criminal at once enable the police to identify him, if he has already come through their hands. Secondly, there can be no question of mistaken identity where the fingerprint is available for evidence. The long-drawn weariness of the Tichborne trial would have been dispelled in a single day If the real Tichborne had only left an impression of his fingerprints at home, and Mr. Beck's sufferings would have been impossible if the Fingerprint Department at Scotland Yard had existed when his double was first convicted. It is hardly possible to overrate the Importance of such a system to a civilized society. 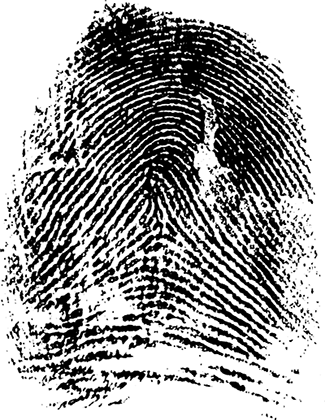 The value of fingerprints as identification marks, though it has only lately been introduced to our criminal jurisprudence by Dr. Galton's labors, seems to have been known to mankind from very early times. The British Museum contains an Assyrian brick on which the seller of a field impressed one of his fingers as a witness to his signature. Students of survivals in culture have suggested that one of our apparently meaningless legal formalities is a vague memory of some forgotten lore of this kind. In signing an important deed, the parties to it still place their fingers on a wafer and remark that they deliver it as their act and deed—like Mr. Witherden in the Old Curiosity Shop. The original meaning of this ceremony has never been clearly explained. Probably it is merely a relic of the ancient belief that personal contact of some kind was necessary to make a deed valid: but it is also possible that it dates from the older practice of not merely touching the deed but leaving a fingerprint on it. "Such hand-prints," Dr. Galton tells us, "have been made and repeated in many semi-civilized nations, and have even been impressed in vermilion on their state documents, as formerly by the sovereign of Japan." Meadows Taylor, in a paper on land tenure in China, gives a facsimile of a deed which Is authenticated by the fingerprint of the vendor, according to a common practice in that mysterious country. The engraver Bewick verified one of his books by the impression of his inky thumb, and an American geological surveyor, much plagued by Mexican forgers, hit upon the same method of signing the cheques which he had to pay out on behalf of the Government. But the first definite and regular use of the fingerprint as a preventive of forgery is due to Sir William Herschel. one of a distinguished scientific family, during his service in Bengal. About 1858 he was so much bothered by the wily Hindu that he began to use the signature of the inked finger, chiefly with the idea of frightening the man who made it from afterwards repudiating his formal act. He found that his adoption of the Indian tipsahi had far-reaching consequences. The fingerprint not only acted as a moral deterrent to the forger, it also afforded an unmistakable means of identifying signatures. The natural idea of the Bengali is, as Mr. Kipling shows in The Gate of a Hundred Sorrows, that a pension should be paid as long as there is any one to pass a forged receipt on the authorities, and it is almost impossible for a European to detect a forgery in the characterless native scripts. But when Sir William Herschel adopted the fingerprint as a sign-manual and forced all pensioners to authenticate their receipts in this way, he put a speedy end to the forgeries which had been a source of considerable loss to the Government of Bengal. His work lasted over a quarter of a century, in which time he fully satisfied himself that fingerprints could not be counterfeited and did not change perceptibly with the advancing years of their owner. Yet it required nearly half a century for this excellent and simple plan to commend itself to the Indian Government. In 1896, the postmaster of Bengal at last adopted this safeguard against the fraud so rife in his districts by compelling all who received payment of a post-office order to furnish an impression of their thumb, which effectually prevented the common trick of asserting that the wrong man had been paid. During the last decade, the fingerprint has been generally recognized as the most perfect method of identification. But by no means all its possible usefulness has yet been exploited. The forgery of wills and other documents would be rendered almost hopeless if every citizen were compelled by law to supply a set of his fingerprints to be filed at Somerset House with the certificate of his birth, and if it were further enacted that all documents must be authenticated by fingerprints as well as signatures. The comparison of any disputed document with the official fingerprint would afford an immediate and satisfactory test of its genuineness since it seems to be impossible to forge a fingerprint satisfactorily, and it is as certain as anything can be that no two men resemble each other in the marks on all their fingers. Society's perpetual war against crime would surely be facilitated by the adoption of this reasonable and not impossibly cumbrous precaution.